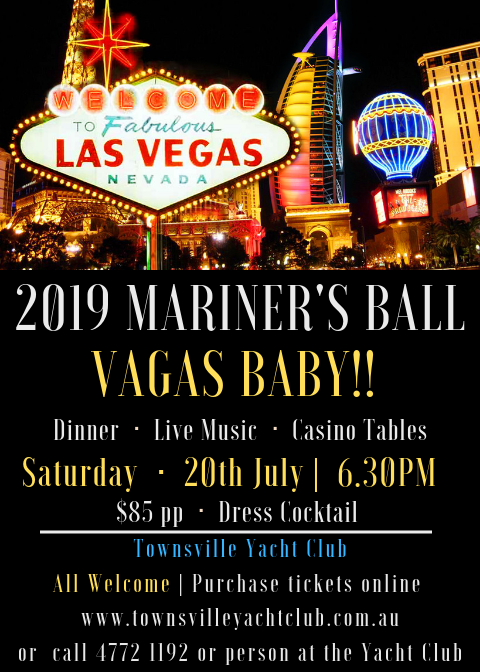 All Members & guests are invited to the 2019 Mariner's Ball. The Yacht Club is closed for this Exclusive Ticketed Event!! Enjoy a night in Vegas. Starting with pre dinner drinks & canapes from 6.30pm, then be seated on The Deck for Dinner. With live entertainment and Casino tables. A night not be be missed!! Click here to purchase your tickets or call our friendly staff on 07 4772 1192 or when you are next in the club.